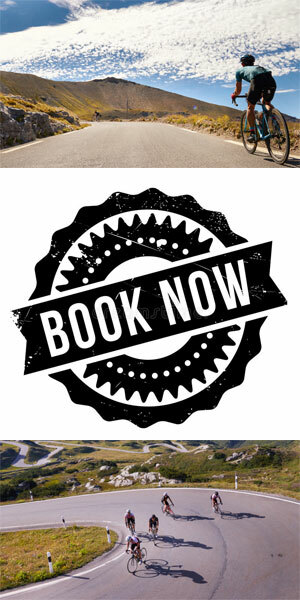 2019 Cycling Holidays Now Available! “WOOP, WOOP!” We’re delighted to announce our departures for 2019 and we’ve a whopping 79 to choose from across 22 different itineraries – so we really do have a holiday (or two) for everyone! If you’re tempted to come away with us next year, especially if you’re in a group of mates and / or you’re interested in going on holiday in either June or September, then we advise you to GET IN TOUCH sharpish, as these spaces always sell out super fast! Check out our 2019 dates and itineraries … you’ll see that we’ve some real gems, whether it’s our Classic Cols style holiday that suits you, with their flexible itineraries, or is 2019 the year you take on one of our Raids or set challenges? Either way, we believe that our second-to-none road cycling holidays with 2 guides on the road every day, backing you up in case of every eventuality – whether it be a mechanical or a desire for more M&Ms – really are the very best out there. Add to this our genuinely crazy attention to detail and this means that all you really need to think about when you’re on one of our holidays is turning the pedals. Many of you, our lovely clients, tell us so time after time…. QUICK! 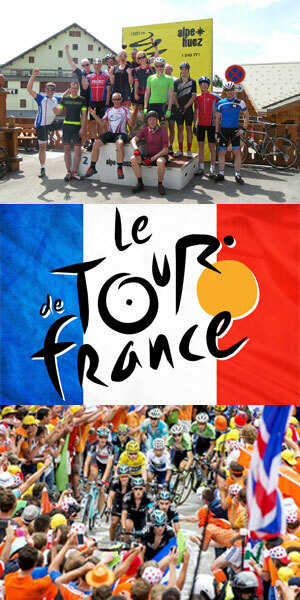 £200 offTour de France Alpe d’Huez! With Le Tour starting on Saturday 7th July, and our Tour de France Alpe d’Huez holiday imminent (15th-22nd July), we’ve a last minute offer that, should you be available, simply cannot be missed. Due to a last minute cancellation, we’d love to offer £200 off if you book either of these last 2 places on this holiday of a lifetime. And if this will be your 3rd holiday with us, you’ll also qualify for our loyalty discount of 10% off the cost of the holiday. Over half a milion people are expected to descend on the side of the mountain for this one week in July and due to our long-standing relationship with the owners, we’ve secured the entire Hotel Chamois right in the centre of Alpe d’Huez for 4 nights, to give you an unrivalled position at the cente of the action. This is a Classic Cols style cycling holiday, so each day we offer a variety of ride options to suit cyclists with a range of fitness levels and aspirations. You really can ride the climbs at your own pace and with 3 support vehicles (yes, 3! ), we’ll never be far away with that much needed morale boost, snack, top up of water or other assistance. You’ll have the chance to ride most of the classic TdF climbs of the Maurienne and Oisans valleys, including the Galibier, Croix de Fer, Madeleine and the modern classic of the Lacets de Montvernier … not forgetting L’Alpe d’Huez itself (up to 3 times). So drop us a line toute de suite if you want to take advantage of this last minute scorcher of a deal! 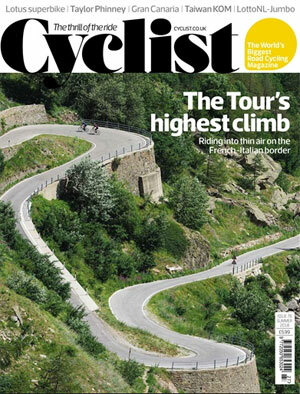 Those of you who are Cyclist subscribers* may have spotted us featured in the latest Summer issue. We were delighted when Cyclist contacted us (again!) to partner with them on their The Big Ride article (that was, natch, their cover photo). If you haven’t seen it, check out the full article on our Press page. This time it was crossing from France to Italy via the Cime de la Bonette – “one of the true giants of the Tour” (Cyclist), and the highest road going over a col in Europe at 2,802m. Freelance writer Trever Ward rode with our very own Marmot Tours guide Tim Myers, who has guided clients on our Raid Alpine over the Cime de la Bonette many times, although always in one of our support vehicles. If the article has tempted you to take on this truly epic ride, check out our Raid Alpine where in addition to the Cime de la Bonette you also get to tackle the Grand Colombiere, Cormet de Roseland, Col du Telegraphe, the infamous Col de Galibier and Col d’Izoard, not to mention several other beauties (some with particularly ‘cheeky’ gradients!). For a more flexible itinerary that really is suitable for mixed ability cyclists (yes, really! ), ourClassic Cols of the Southern Alps holiday is sure to be a fantastic trip – we’re due to launch this later in the summer so watch this space for 2019 dates! * copies are still on sale at your local newsagent! Having completed a Raid Pyrenean with us in 2017, Sharon loved it so much that she decided she wanted to come and work with us, and how lucky we are to have her! Sharon is a self-confessed bike nut but more than that, she is super capable at bike mechanics, she’s genuinely warm and personable by nature plus she has amazing, motiviational skills when you’re struggling up a climb (ED: spoken from my experience on Ventoux!). Secondly, we’re delighted to welcome David to the team. David ‘approached’ one of our groups on a Picos holiday and since then we’ve become firm friends, as it were! From Spain but also fluent in English and with French and Italian under his belt, it’s great to have David’s linguistic skils on board, as well as his passion for cycling and ensuring every client he supports has the very best holiday they can. Last, but by no means least, we welcome back Nathan to the Marmot ‘family’. Nathan first worked with us way back in 2007 but after going off to start a family three years ago, we’re chuffed to bits to have him return. Nathan’s years of experience (plus charm and cheeky sense of humour!) mean you’ll be in a very safe pair of hands if he’s guiding your holiday. About a week before you’re due to go on holiday, we will post your transfer times and final joining details to The Link, and it’s then that you can check out which guides you’ll have supporting you on your holiday. At that point, all you need to do is pack and count down the days!